BILLINGS – With President Donald Trump clamoring to defeat U.S. Sen. Jon Tester and conservative groups spending heavily against him, the Democrat is falling back on a well-worn strategy in his pursuit of a third term: make the election about Montana, not Washington, D.C.
Trump’s feud with Tester, triggered by the lawmaker’s opposition to Trump’s choice for Veterans Affairs secretary, has blossomed into an all-out presidential campaign to install Republican Matt Rosendale. Trump is making a record fourth visit to Montana on Saturday. Instead of fighting back, Tester has sought to ingratiate himself with Trump’s supporters, reminding them of legislation on veterans that he sponsored and the president signed and touting his understanding of the state as a lifelong resident and farmer. Tester avoids almost any mention of Trump in campaign speeches. He speaks about health care and Republican proposals to make it harder to get coverage for pre-existing conditions. He talks about protecting public lands in the state, while demonizing his opponent as “Maryland Matt,” a real estate developer from Maryland who falsely claims to be a rancher. Rosendale, Montana’s state auditor and insurance commissioner, has looked to score points by using the GOP playbook – plugging a hardline immigration stance and highlighting Tester’s opposition to Trump’s Supreme Court nominees. But his primary strategy seems to be riding the president’s coattails. A Rosendale victory would give Montana an all-GOP congressional delegation and could cement the party’s control of a closely divided Senate. Rosendale, 58, moved to Glendive, Montana, with his wife and three sons in 2002. He won a seat in the state Legislature in 2010. He ran unsuccessfully for the U.S. House in 2014, became state Senate majority leader the next year and was elected in 2016 as state auditor. Tester, 62, is married with two children. He took over his family’s farm in the town of Big Sandy after college and taught music at an elementary school. He was elected to the state Senate in 1998 and the U.S. Senate in 2006. 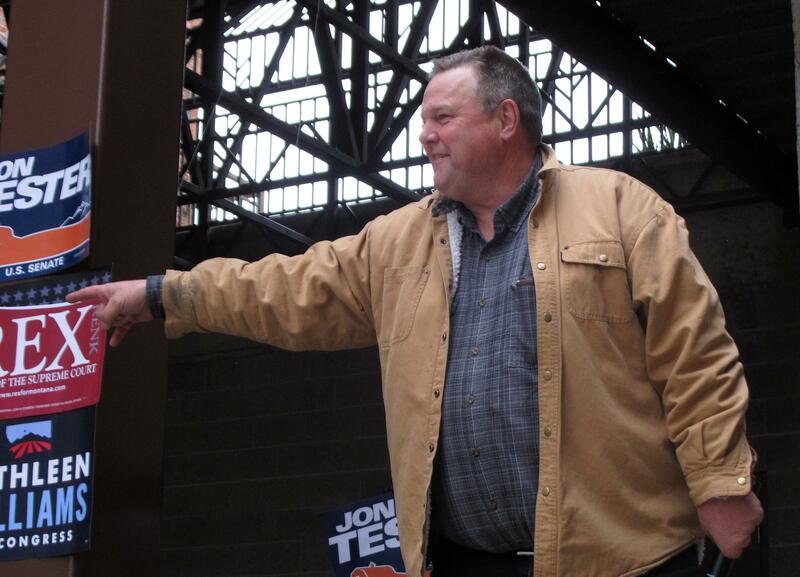 In 2012, Tester beat back a challenge from a Republican congressman. Libertarian Rick Breckenridge rounds out Tuesday’s Senate ballot. He hasn’t been actively campaigning and on Thursday threw his support behind Rosendale. The move caught Libertarian leaders off guard and was disavowed by the party’s chairman, Francis Wendt, who said Rosendale was weak on personal privacy protections. The GOP is hopeful the move will prevent a repeat of Tester’s 2012 re-election, when a Libertarian candidate peeled away enough votes that they could have changed the outcome if they had gone to the Republican. Trump’s appearance Saturday in Belgrade will mark the most visits to Montana by any sitting president. He took a personal interest in the race after Tester released allegations of workplace misconduct against Trump’s first nominee for VA secretary, Ronny Jackson, who withdrew from consideration in April. Jackson has denied the allegations and they are being investigated by Pentagon officials. At Saturday’s rally, Trump railed against Tester for three minutes for attempting to “ruin” Jackson, “the most clean-cut, wonderful person that’ you’ve ever met,” the president said. The president’s attentions have helped boost a candidate who wasn’t the GOP’s first or even second choice to take on the two-term incumbent. The White House blitz in Montana also included multiple trips by the president’s son, Vice President Mike Pence and a parade of Republican senators. The visits have fired up interest in the race but that could backfire if it motivates voters who disapprove of the president, said David Parker, a political analyst at Montana State University. “They’re putting all their chips on the table with the Trump brand,” Parker said, adding that Rosendale’s campaign had no choice, with Tester outraising him 4-to-1 in donations. Outside groups and donations to the candidates have reached $60 million, a record for Montana politics. In Rosendale’s view, Tester embodies the same corrupt Washington establishment that the Democrat pledged to change when he first ran in 2006. Tester now ranks as one of the top recipients of cash donations from lobbyists among all members of Congress, according to the nonpartisan Center for Responsive Politics. Tester has made a name for himself as a proponent of campaign finance reform and says the amount of money going into the race is out of his control. Published: Nov. 3, 2018, 12:43 p.m. Updated: Nov. 3, 2018, 4:32 p.m.